The catalytic activity for the hydrogen evolution reaction (HER) of Ni/WC composites obtained by electrochemical deposition of nickel from a conventional Watt’s bath, using two different ways of depositing the WC particles, was investigated. 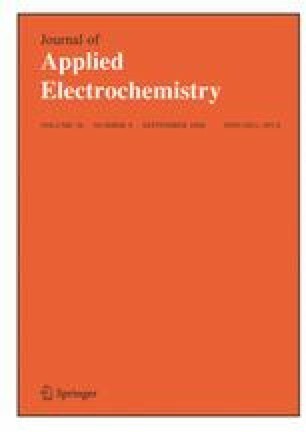 All the composite coatings exhibited electrocatalytic activity for the HER larger than that of pure Ni in both alkaline and acid solution. The activity increased with increasing content of WC in the coating and, in the pulsed current regime, with increasing frequency of pulsation. In addition, coatings with smaller particles incorporated exhibited higher activity than those with larger particles. At a constant potential, an order of magnitude higher current densities were obtained in some cases. The authors would like to thank the Ministry of Science and Environmental Protection of the Republic of Serbia (Contract No. 142044) and Prof. Snežana Gojković from the Faculty of Technology and Metallurgy, University of Belgrade for valuable discussions concerning the final version of this paper.